His team didn’t win, but Jake Renfree had a lot of fun. Most likely going to Scotland and running in the Simplyhealth Great Stirling Run on Jan. 12 will be a memory he will never forget. 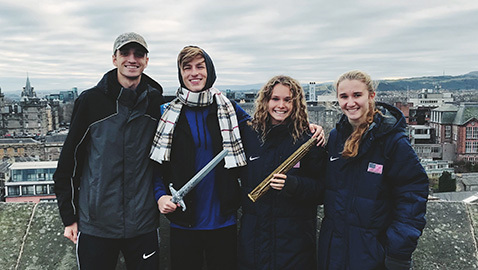 The Knoxville Catholic senior was named to the USA Junior team and his teammates were Drew Bosley, Katelynne Hart and Kelsey Chmiel. They placed second among junior teams in the 4×1500 relay, finishing in 18:11. They were fifth overall. Team Europe was the winner of the junior race with an 18:08. The junior team finished only 10 seconds behind the senior group. “The last leg came down to the wire but Team Europe just edged us out by three seconds,” said Renfree. “Either way, my team was happy and I was pleased with the race. Catholic Coach Sean O’Neil added that 1500 meters is an unusual distance for a cross country race. “They were all used to running 5K’s, so it was a bit of an adjustment, but they all ran well and it was an amazing event,” said O’Neil. BACK INDOORS: Renfree, a Notre Dame signee, was scheduled to race in the invitational mile at the Virginia Showcase Indoor Track meet at Liberty University Friday.